Commit to a healthier lifestyle today, it can truly help you grow and keep your practice strong, save money, and take advantage of the many benefits of being a member. *Requires direct monthly billing to a credit card or checking account. Suspend your account for up to two times per year for a total of 30 days. Your account will be re-activated at the end of the freeze period at the rate you originally signed up for. Expecting mothers can suspend membership up to 9 months. Cancel anytime by emailing us at namaste@yogaomalaska.com before your billing date to prevent future payments. We do not take verbal or phone call instructions for cancellations, cancellations only via email. *Pricing excludes 3% city sales tax. *Expiration dates are strictly enforced. 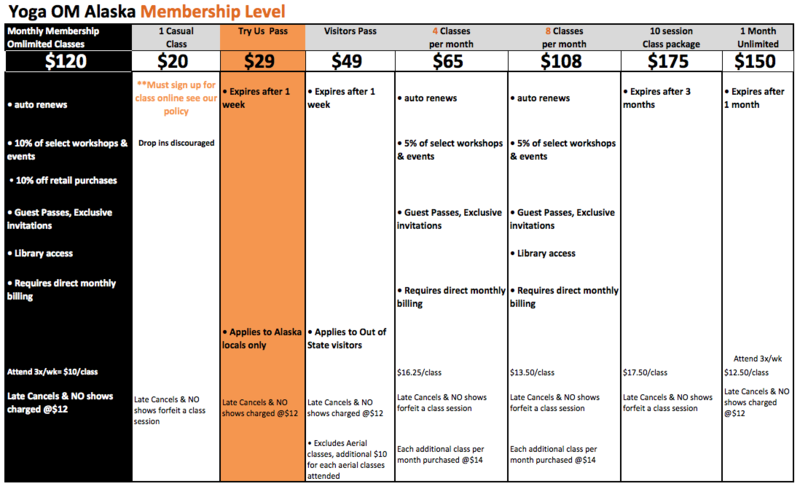 We’ll allow one-time extension for a $25 fee, all unused sessions shall be used up within 30 days of extension date. It happens to even the most dedicated practitioners – sometimes, you just have to cancel a class without much notice at all. We want to help you balance your busy life and your strong yoga practice, so we’ve developed policies to make it easier to get your work in as well as honor your teacher’s time and effort. Teachers show up to teach, please respect your commitment to yourself and your teacher. 4 Hour Class Cancellation Policy: Yoga Om enforces a strict 4-hour cancellation policy. If you have reserved your spot in any classes and fail to cancel 4 hours in advance you will be charged $10 and/or forfeit a session for the class. 6am classes must be canceled 10pm the night before. Late Arrival Policy: Yoga Om enforces a Late Arrival policy. If you are more than 5 minutes late for your class you will lose your spot and incur a Late Cancel Charge of $10 and/or forfeit a session for the class. You must arrive at least 15 minutes before class so as not to disturb your fellow students. Cancellation of Classes: Yoga Om strongly recommends online sign up. Sign up online at least 2 hours prior to the scheduled class (sign up by 10pm for the 6am class the following day). Classes with zero sign up 2 hours prior to the scheduled time may be cancelled.